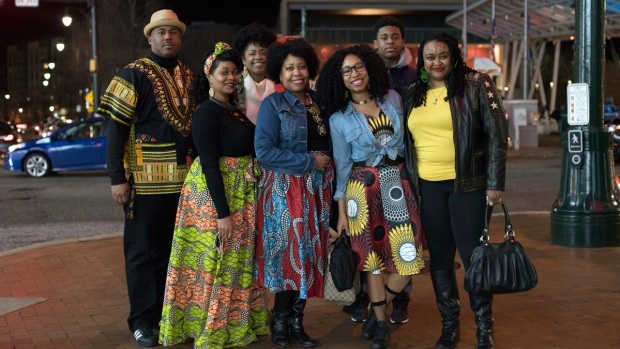 "Black Panther" screen attendees during in event in Harlem on Friday, Feb. 16. 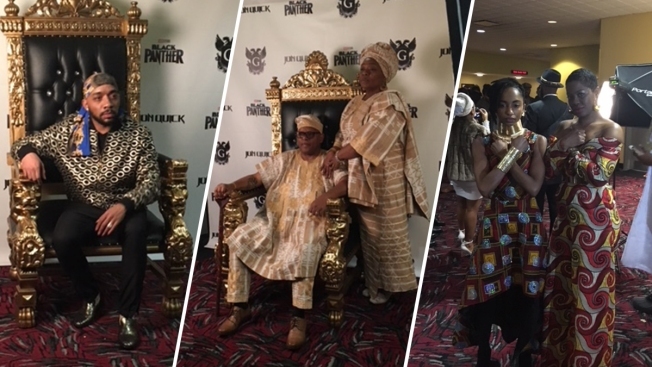 Black beauty queens and African kings came to slay at an event for the opening of Marvel's "Black Panther" at AMC Magic Johnson Theater in Harlem, on Friday night. Tim Grae and his company Grae Enterprises LLC rented out one of the only minority-owned theaters in New York City to give members of the community a night to express themselves, with most of the attendees wearing African diaspora and cosplay attire. All the screenings at the venue were showing "Black Panther," with hundreds of people gathered for the sold-out movie. "This is the first time our culture was able to see themselves on screen in a regal format since the Roots series, which was in the 1970's," Grae said. "I'm from Harlem. So we wanted to support the community by bringing it to the community and it's a beautiful reflection of what we can be." The Ryan Coogler-directed film has inspired people from different backgrounds to embrace African culture, history, and black excellence. The movie earned an estimated $25.2 million from Thursday preview screenings alone and could net up to $198 million through this holiday weekend. Friday's night's screenings filled many moviegoers at the event with a sense of pride in themselves and gave them a better understanding of what it means to be black, including Bronx native Thomas Bristow. "It feels so good to be black and to have a Marvel comic that represents my people of my community," Bristow said. "To see someone that looks like me and that I can look up to, I felt proud,"
During the movie the crowd laughed and cheered throughout for both Chadwick Boseman’s King T’Challa and Michael B. Jordan’s Erik Killmonger. Chadwick Boseman, the actor behind Marvel's titular super hero in "Black Panther," talks about the differences of his role in the movie and his initial appearance in "Captain America: Civil War." "Black Panther" also prominently featured strong depictions of powerful and influential black women on screen including Lupita Nyong'o and Danai Gurira. Thandisizwe Jackson-Nisan, who attended the event as Miss Black Minnesota USA, was amazed at the cultural significance of the film and how it inspires young black women to reach their full potential. "I was emotional. I think so highly of our people. Our people are magnificent, mighty people, excellent, extraordinary people," Jackson-Nisan said. "For us, this was educational, informational and a good example of how we can rise up even when we're not dealt the best hand." Grae hopes that the youth can ultimately learn a lesson about the importance of their heritage from the film and aspire to be royalty just like the kings and queens of Wakanda. "The bottom line is we can do it also," Grae said. "Everything is about dreaming. So if we show young men and young women that they are kings and queens they will take pride in where they come from." "Heritage is a very important thing that we need to be reminded of because most stories start at slavery but this one doesn't." Grae added.